Phil Key had spent eight years with the La De Da's before forming Band Of Light in October 1972 as a more introspective, personal venture. Ian Rilen replaced original bass player Peter Roberts after only three gigs. Master slide guitarist Norm Roue and drummer Tony Buettel completed the line-up. Norm had played with Gutbucket, Lotus and Wolfe. Peter had played with Freshwater and the La De Da's, and Tony with Bay City Union, Levi Smith's Clefs, Fraternity and Band Of Talabene. Band Of Light immediately established a slow, heavy blues style dominated by Roue's stinging slide work. Key also introduced a quasi-religious philosophy into the band's lyrics that espoused racial equality, social justice and spiritual harmony. The band worked the Sydney and Melbourne pub circuit and scored a national number 18 hit single in July 1973 with the infectious boogie rocker "Destiny Song"/"Over B" which was taken from the album "Total Union". Mostly the album was standard hard rock, slow 12-bar blues and boogie, but the best tracks revealed Band Of Light to be an energetic and funky rock band. The second single "Free Them From Hunger"/"The Cat" in August and the non-album "Moonstruck"/"If" in November failed to chart. 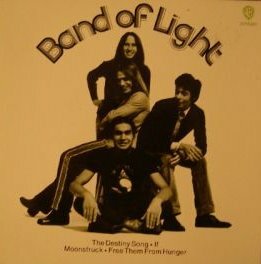 Roue, Rilen and Buettel all left Band Of Light in mid-1974. Roue went on to join Buffalo, Rilen helped form Rose Tattoo in 1976 and Buettel went into production work. Key was ready to record the band's second album and called in Billy Williams, previously from Classic Affair, to play bass and Danny Davidson, from Tamam Shud and Kahvas Jute, to play drums, in order to complete the album. Released in 1974, the album "The Archer" had a much drier sound than the debut and failed to chart. The single "The Archer, A Sagittarian Rhapsody"/"Silus The Sun" was not successful. Ray Vanderby on keyboards and Eddie Hansen, from Ticket, on lead guitar, filled out the basic three piece line-up for live dates, but by the end of 1974 the band had broken up. Key ended up driving taxis in Sydney for many years. He died in May 1984 as a result of a congenital heart condition.